TOKYO – A U.S. search team on Iwo Jima is slashing its way through thick, thorny brush to find a cave where the Marine combat photographer who filmed the iconic World War II flag-raising is believed to have been killed by machine gunfire. It’s the first American search of the remote Japanese island in 60 years. The team is seeking the remains of Sgt. William H. Genaust and other Marines who died in the battle for Iwo Jima, a turning point in the war with Japan. This is today’s example of how icons generate stories. Often they are stories of the people photographed or the photographer, or of how photographer and those in the picture developed a relationship in later years. The iconic image seems to create a need for narrative continuity and closure. The image may create a social rupture or simply a need for to know more about those we become attached to, but the stories always appear and keep appearing. 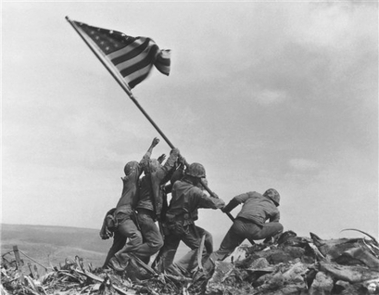 This story of a second cameraman, one all but forgotten, may demonstrate the historical and emotional depth that the Iwo Jima image has acquired. This reminds me of reading about similar follow-ups to the story of Kim Phuc, the little Vietnamese girl photographed after being burned in a american Nam Napalm strike. The follow up, years later, on the fate of this one girl among thousands of children injured and maimed during that conflict, would not likely have happened save for the iconic stature that the photograph attained.